Network Technician Nick Mitchell (Left) discusses implementation among the stacks of new technology with Founder Baker Mitchell (Right) at The Roger Bacon Academy's Charter Day School. LELAND, NORTH CAROLINA: March 16, 2011 – “Resourceful” is a popular word at The Roger Bacon Academy’s Charter Day School. Even though they are public schools, charter schools receive less money per pupil than traditional public schools. But this has not stopped growth at one of the premier charter schools in southeast North Carolina, and technology is at the center of that growth. Some smart and resourceful upgrades have taken place at the school this year. Those changes include a new fiber optic line that runs directly to the school for 6 times faster internet connection speeds – it also cut the cost in half. A new campus wide wireless “N” system was also implemented this year that creates a communication dome among classrooms and staff offices. New seamless video cameras have been installed in each classroom for interactive teacher training and student security. A revamped computer lab has 26 new Windows 7 work stations that run on a virtual desktop configuration making up to 6 computer workstations from 1 desktop. The virtual desktop configuration is also being implemented in all the classrooms on campus turning 35 computers into 175+ work stations. All work stations include LED monitors that are highly efficient and longer lasting. New ultra-bright projectors, which are essential for teaching aides and presentations, are replacing the older, less bright projectors in every classroom as well. “The overall improvement plan was projected to cost nearly $97,000, but by building multi-tasking computers in-house and maximizing network efficiency the whole package came in under $22,000 and saved nearly $55,000,” said Network Technician Nicholas Mitchell.. 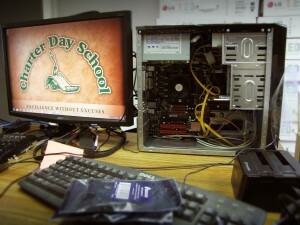 Desktop computer being modified to make up to 6 workstations for classrooms at The Roger Bacon Academy’s Charter Day School. But there are more technology upgrades that need to be done including document cameras, audio response systems, and other 21st century technology systems to maximize student learning and teaching. 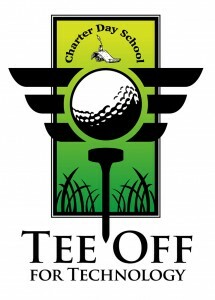 To help with expenses Charter Day School is hosting its second annual Tee Off for Technology Golf Tournament on March 24, 2011 at Brunswick Forest’s Cape Fear National Golf Course. All proceeds will be going to the expansion of the media and technology program at Charter Day School. The event will include a box lunch, 18 hole best-ball tournament and dinner at Cape Fear National clubhouse. Awards will be given and will include a silent auction and a raffle for a private Gulf Stream Fishing Trip for up to 6 people from Reel-em-N Charters. Single player cost is $100 and $375 for a foursome. or go to www.chartersdaychool.org to find out more information about our tournament, and the school. The school is also looking for companies to donate items to our golf tournament raffle or auction. Contact Brad Barth, Public Affairs Director at The Roger Bacon Academy for any questions or information at 910-655-3600 ext. 224. The Roger Bacon Academy’s Charter Day School is a tuition-free, open enrollment K-8 public school in southeastern North Carolina. Since 2000, Charter Day School has focused on quality education and is a premier performance-driven year round school. Widely recognized as a compelling choice to conventional public education the school has built a reputation for dedicated and highly qualified teachers that give students a strong and proven academic foundation. Charter Day School has received numerous awards, including the designation of being a Top-25 School for Academic Growth and of Excellence in the state of North Carolina.